My guess for Dutch state visit to UK. Q.Elizabeth II GD Vladimir with pearls. I missed that and I agree with you. Maybe the Queen will wear the King George IV State Diadem. In my humble opinion one of the most impressive and regal diadems. Also the Girls of GB&NI Diadem is a masterpiece. I hope the Queen leaves the sapphire, the aquamarine and the Burmese rubies diadems in their cassettes. These are once beauties changed into monstrosities, I am sorry to say. Camilla's Greville Diadem is spectacular. The Delhi Durbar was a success with Camilla. I would like to see it once again. For Queen Máxima my wish is that she wears one of the fantastic stomachers: the massive bow brooch with the dangling teardrop diamonds, the Russian bow brooch with the pink diamonds, the Mellerio ruby stomacher with all the hanging prongs, the Sapphire bow brooch with big sapphire pendant, the Art Deco Stomacher with the brilliant cut diamonds. I'm sure The Queen will wear a combination of her standard jewels for state visits, nothing special. She didn't make an extra effort for the Spanish visit and I expect the same will be true here. The last time she brought something special out for a state visit was the one in Germany when she wore that astonishing ruby necklace and brooch. I'd never heard of the Stuart tiara until I read this thread and I understand why Maxima has chosen not to wear it, it just looks like a big mess. Large stones almost never work in tiaras which is why I'm so glad The Queen has never been tempted to use the Cullinans in her tiaras. I am not sure if the bracelet is easily reassembled. And since it has been broken up we have not seen the diamond Garudas, which probably still exist and should be able to be used as a brooches. Perhaps we will see them when there will finally be a state visit from/to Indonesia. Though sensitivities about our colonial past may have made the RF decide to retire them all together. I certainly do not expect to see the old bracelet or Garudas now. I'd never heard of the Stuart tiara until I read this thread and I understand why Maxima has chosen not to wear it, it just looks like a big mess. Have you seen the Diadem from the Parure with the House Diamonds, recently worn in thje smallest version ? The top frame with the Stuart diamond and other big gunners were removed, only the base was left. The result is still impressive. This necklace is also part of the Parure with the House Diamonds: picture. The rectangular thickstone diamonds and the drop diamonds in the necklace belong to the very oldest in the family collection, Mary II Stuart has touched these with her own hands, so to say. There will be a Belgian state visit to Portugal this month. If Mathilde will wear a tiara I predict it will be the wolfers tiara. I agree with you, i guess she wears the Wolfers, i would like to see the 9 Provinces bandeau..
Could also be her laurel-wreath tiara. In addition to the tiara's I hope./think that Queen Maxima will also wear Princess Amalia's pearls -perhaps on arrival. It is the most important necklace in the collection that can be worn in daytime. The Queen has only worn it once before, during the incoming state visit of the Argentinian president. Agreed, it would be great to see the pearls. Any guess which brooch Q.Elizabeth II might wear for arrivial? I know its unlikely but i really would like to see the Q.Alexandra wedding necklace/earrings on Q.Elizabeth or the Ruby Oriental Tiara/necklace. I still hope one of these things will happen, i mean just a few people expected the Aquamarine Parure during spanish state visit. IMO, the rubies will be an unusual choice for HM. 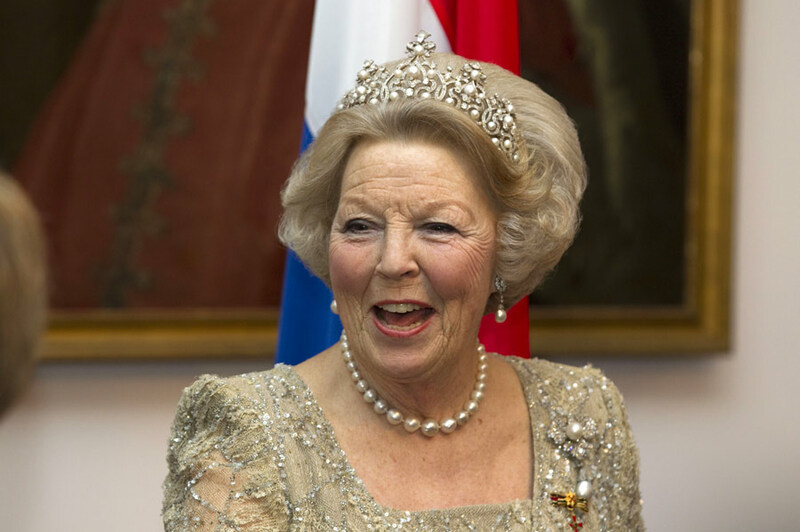 The Dutch sash will be orange and blue, so I expect her jewelry to be quite neutral (pearls or diamonds, or the sapphires . Let's see. Queen Elizabeth II has worn rubies for a Dutch State Visit before: picture. Quite right, but it would be an unusual choice to mix rubies with a blue and orange sash. The state dinner in Portugal will be black tie. Queen Mathilde may not wear a tiara after all. If she does, it will probably be the Wolfers or the laurel wreath.